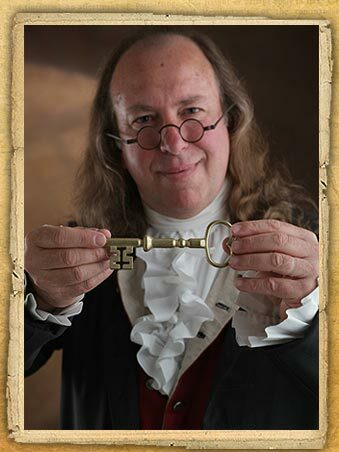 I’d like to take this time to tell you what a hit your personification of Dr. Benjamin Franklin was at the Cancer Survivor's Day Celebration here at Lankenau Hospital last Thursday night.I have had several staff members comment on what a wonderful presentation you gave!" "Id like to express our sincere appreciation for your participation in our Annual Art Festival.You certainly brought history alive and created an awareness which is often forgotten. You appeared so life-like that many of the people you came in contact with that day related to you as if you were indeed Benjamin Franklin! Your sensitivity and willingness to adapt to last minute requests from the Crystle Combo was delightful. Your flexibility is definitely an asset as is your gentlemanly manner which speaks to the day." "Great Job! Thank you so much for participating in our national AIGA Revolution: Philadelphia conference. With over 250 attendees representing over 30 states, we were so pleased to be able to introduce them to a little bit of Philadelphia history through your appearance as Ben Franklin. Since we all have printing backgrounds, your story of the trials and triumphs of Ben Franklin the printer was terrific and so appropriate. Thanks again!" Fast Fact! Ben Franklin was the first person to propose daylight saving time!